Hydroxycut Shape - Diet Pill Reviews: Does Hydroxycut Shape Really Work? 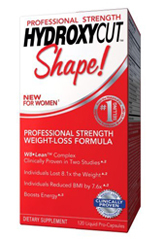 Hydroxycut Shape is one of the newest weight loss supplements from the well known weight loss company. This formula is specifically designed for women, and comes packed with all natural ingredients that work together to boost the metabolism and help dieters burn fat and calories more efficiently. The product is sold through a variety of retailers, and currently sells for about $45 for a one-month supply. Many of the Hydroxycut products are touted as the perfect solution for professionals who need to maintain a trim figure for their jobs, such as performers and models. Hydroxycut Shape is no exception to this rule, citing this formula as a “professional” solution to weight loss. The supplement is taken twice a day, with the dosage gradually increasing for the first three weeks. There are no diet or exercise recommendations by the company to enhance weight loss results while on the supplement. MOTIV 8 – This blend includes caffeine anhydrous, which is a known stimulant found in many weight loss products to rev up the metabolism and increase energy levels. To boost the effect of the caffeine, another stimulant, guarana is also included. The blend also contains L-carnitine, which is popular with body builders because it is thought to increase muscle mass while burning fat. W8 Lean Complex – This blend is a combination of herbs that offer many health benefits, but few advantages in the area of weight loss. The company does state that the blend has been tested in clinical trials and has proved helpful in dropping excess weight. HydroxyShape – This complex consists of gamma-oryzanol and L-orithine. Gamma-oryzanol is thought to release “feel good” hormones known as endorphins, which may boost strength and energy levels. L-orithine may enhance workouts and help burn fat while producing more lean muscle. The twice-a-day dosing begins with one capsule for the first two days and then gradually increases to three capsules per serving for the majority of the program. The program recommends that you consume 8-10 glasses of water daily while taking the supplement.